In-Bulit Titration System Colorimetric Titration, system based on three RGB color sensors that allow use of a wide range of indicators. 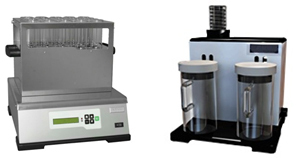 Unique Predictive Titration system automatically adjusts titration speed on the actual distance from the end point. PTFE tubing used throughout to eliminate formation of air bubbles between burette-titration vessel. Selectable Delay Time 0-300 sec. Open Data Format Well documented transfer protocols. Example code (for sending of weight entries and retrieving data) for Excel Spreadsheet provided. Recommendation on transfer programs for Android, iPad, iPhone, Windows and Mac OS. Drainage of waste Automatic emptying of tube. Programs Standard, Special with full traceability and Auto Clean methods. Five user defined program buttons, (any method, with easy access from main menu). Unlimited amount of combinations between methods and programs. Distillation Head Easily exchangeable Splash head with only one tube connector made of glass to reduce carry-over effects. Programs Standard Method, Special Method with traceability and Auto Clean. User-configured five program buttons directly accessible from main menu. Expandable Systems The KjelROC Manual Distillation Unit can be upgraded to Auto Distillation Unit and further to a full KjelROC Analyzer system by Easy addition of the Titration Module and exchange of Front door (optional). From 20˚C to 450˚C within 45 minutes. instrument until Service has been performed. Indicator light to warn if program is running. Reagent containers Two Reagent containers with a volume of 2 liters each, minimize the need for frequent change of scrubber reagents. Easy access to exchange containers, which are all made in high quality Borosilicate Glass. Vacuum Pump Accessible 6-step suction control to regulate suction power makes it easy to achieve a good and efficient digestion. Up gradation All KjelROC Scrubbers can be supplied with optional water cooling as well as additional flask for digesting liquid samples.